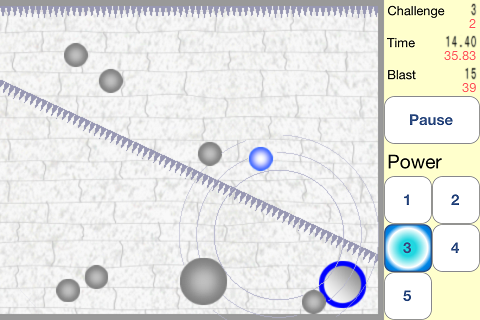 "The Key is Blasts" is a game that you touch screen. If you touch on the play area, blasts are generated from there. 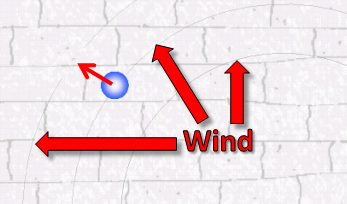 Balls move under the influence of the winds. If you generate explosion at short range by a ball, you can move the ball stronger. If you move a blue ball to a goal hole, you clear the stage. 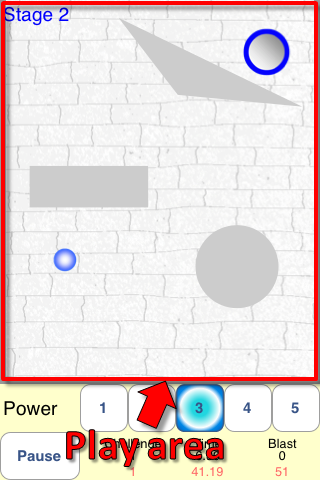 If there is more than one blue ball, you need to move all blue balls to a goal hole. 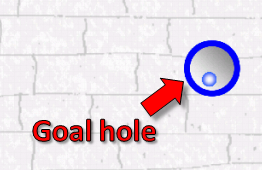 If there is more than one goal hole, you can move a ball to any goal hole. If a ball hit a wall or a ball, the ball bounce. 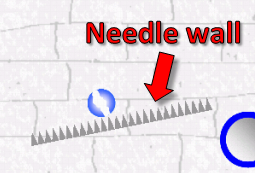 If a blue ball hit a needle wall or is pinched in moving walls, the blue ball will burst and you will have to start over again. If there is more than one blue ball and any ball burst, you will have to start over again. 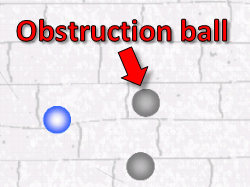 A gray ball is obstruction ball. you need not to move gray balls to a goal hole. Even if a gray ball hit a needle wall, the gray ball won't burst. A gold ball doesn't move under the influence of the winds. If you want to move a gold ball, you need to hit a other ball to the gold ball. 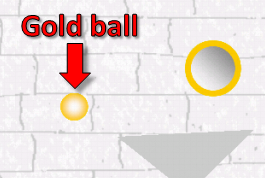 If there is a blue ball and gold ball, you need to move a gold ball to a goal hole first. If there is a gold ball, the color of a goal hole is gold. You can play this game in portrait or landscape. If you play a wide stage, it may be easy to play in landscape. Once you have cleared a stage, if you try clear faster or efficiently next time, it may be more enjoyable. If you Push "Pause" button, you can stop game. When it is on pause, you can scroll the stage on drag in play area. 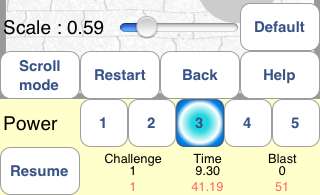 If you touch screen with 2 fingers and widen it's interval or shorten, you can change display scale of play area. While on pause, "Pause" button change to "Resume" button. If you touch "Resume" button, game resume. You can start the stage over again. You can push this button only when on pause. You can stop playing the stage and back to previous scene. You can push this button only when on pause. This explanation that you are reading now will be opened. You can change strength of explosion. Background of selecting power is blue. You can change how scroll display. A blue ball is always in center of the play area or it doesn't scroll to out of the stage. If you push this button, the mode change into another. You can change display scale of play area. Slide scale bar to left or right. you can change scale only when on pause. When you play this game for the first time, the scale is adjusted automatically as stage 1's width is play area width in portrait. If you touch "Default" button, the scale is adjusted to the first state.